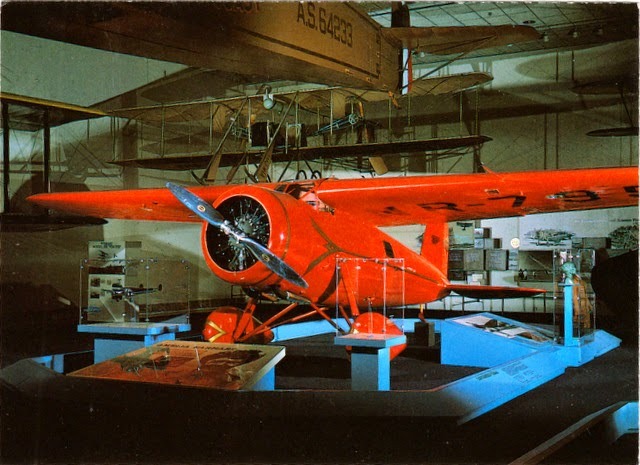 Postcard US-3109087 to France shows Amelia Earhart's Lockheed Vega 5b, NR7952, at the Smithsonian Institution National Air and Space Museum in Washington D.C.
Amelia Mary Earhart, born July 24, 1897, was an American aviation pioneer. As the first female aviator to fly solo across the Atlantic Ocean, she took off from Newfoundland on May 20, 1932 and landed in Ireland nearly 15 hours later in the above plane, receiving the U.S. Distinguished Flying Cross for this endeavor. Amelia Mary Earhart disappeared on July 2, 1937 during an attempt to circumnavigate the globe in a Lockheed Model 10 Electra plane. According to Wikipedia, She was also a member of the National Woman's Party, and an early supporter of the Equal Rights Amendment. Labels: 1897, 1932, 1937, aviation, aviator, flight, Lockheed, National Air and Space Museum, NR 7952, plane, postcard, PostCrossing, sent, Smithsonian Institution, solo, US-3109087, Vega 5b, Washington D.C.